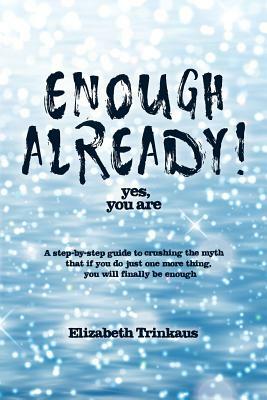 Enough Already Yes, You Are will inspire you to wake up to your truest self by crushing the myth that your enough-ness resides somewhere "out there." Elizabeth offers real-life solutions for you to get who you really areseparate from what you have and doand provides step-by-step tools to help you live in the powerful present. Best of all: Enough Already will have you living with more joy and satisfaction now, and will bring more creativity and inspiration to all those important dreams. So grab a comfy seat . . . this book is in your hands for a reason. Elizabeth Trinkaus is the owner of Pinnacle View, a life-enrichment company. She is a speaker, author, and coach who has been inspiring audiences around the globe for over 25 years. She is a certified trainer for the Canfield Success Principles, Louise Hay Heal Your Life program, and her writing has been included in collections authored by Deepak Chopra and Stephen Covey. Elizabeth resides in Chapel Hill, NC, with her life squeeze, Greg, and their two rescue pups. You can reach her at www.enough.rocks.